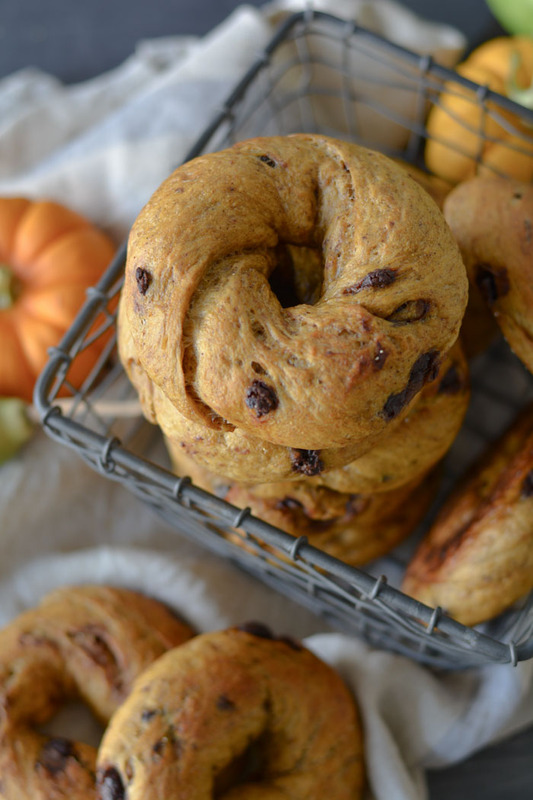 No-knead pumpkin chocolate chip bagels. Just in time for pumpkin spiced everything! There is nothing like a hot bagel fresh from the oven that is crisp and chewy. Bring on October with everything pumpkin. The no-knead dough never lets me down. It’s so simple to make and is mixed together in 5 minutes then left in the refrigerator for several days. Bake up a few or a dozen. Gather and measure all ingredients. In a large mixing bowl, stir together bread flour, yeast, sugar, and salt. Bread flour produces the lightest bagel. I tried regular all-purpose unbleached flour and the bagels were denser. In a 4 cup bowl or measuring cup, stir together pumpkin and water. Pour pumpkin mixture into flour mixture. 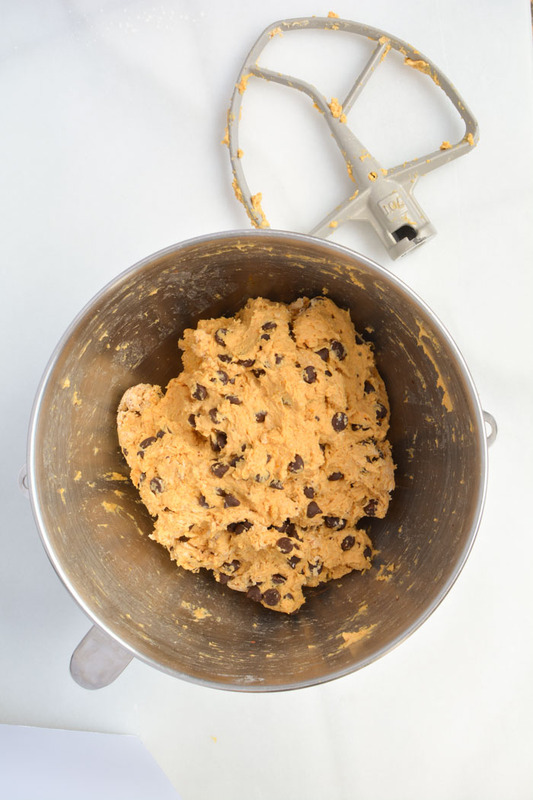 Using a spoon, hands or paddle attachment to a large mixer, stir until the dough barely comes together and no visible signs of flour are showing. Cover dough with plastic wrap or place in a container with a lid, but not air tight. Allow dough to rise at room temperature for 2-3 hours. Don’t punch the dough down. Leave it risen, cover, and refrigerate. Remove dough from refrigerator. The cold dough is easier to work with. 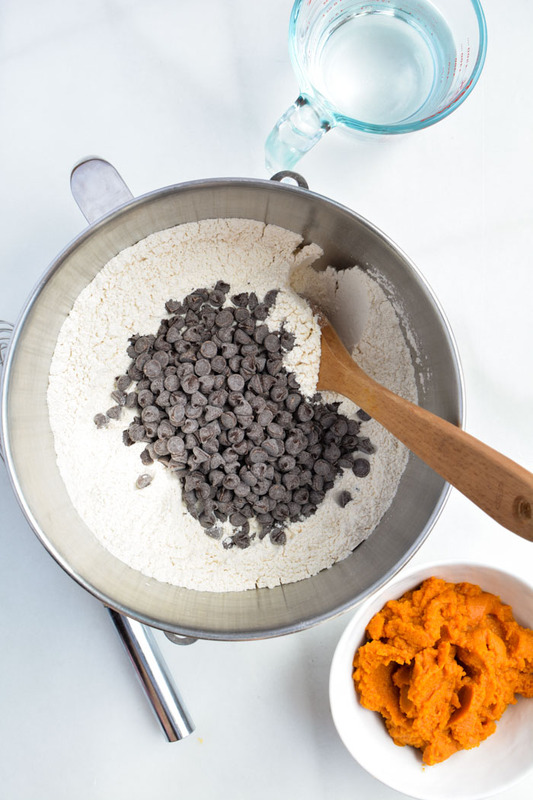 Remove dough from container or bowl on a floured cloth, board, or counter. 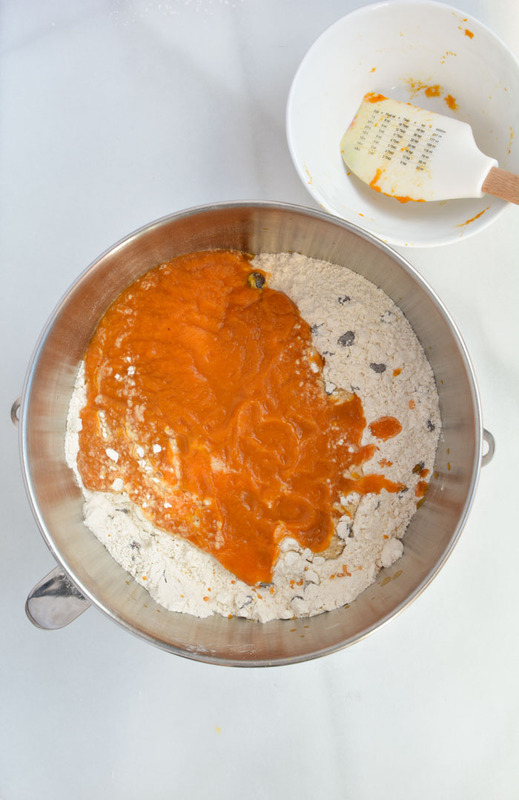 Divide dough evenly into pieces that are approx. 125 grams or 4.4 ounces (give or take). There should be 14 pieces of dough. Degas the dough by flattening with fingers. Fold in long sides of dough and press to seal. Roll piece of dough into a short log type shape. Repeat with all pieces. Cover with plastic wrap and let dough rest at least 5 minutes. Roll each “log” into a rope about 10-11 inches long. Wrap dough around your hand and overlay about 1-2 inches. Press and roll the overlapping dough along a surface than has NOT been floured. This will crimp and seal the overlapping dough. You should have something that resembles a bagel. Don’t worry rising and baking will help, if your bagel isn’t perfect. Place each bagel on a floured surface. A large floured board or floured cloth works great. Allow bagels to rise for at least an hour. Press on the dough. If it feels like a marshmallow, then it’s risen and ready for cooking. The boiling pot: A great bagel is simmered in water before baking. Add at least 4 quarts or more of hot water to a large pot. Add 1/4 cup brown sugar and 1 teaspoon baking soda. Bring to a simmer. Drop formed bagels, 2-3 at a time, into the simmering NOT boiling water mixture. Cook 5-10 seconds per side. Do not crowd bagels in simmer water. Using a spider or slotted spoon carefully lift bagels out of water and touch on a clean dry towel to remove extra water, then place on a baking sheet lined with parchment. Six bagels to a baking sheet. Bake bagels for 14-16 minutes or until golden brown. For crisp bagels add a shallow baking pan in oven on lower rack filled with 1-2 cups of water to create steam. OR Individual bagels can be placed on a preheated pizza stone along with simmering pan of water for a hearth baked bagel. OR bake bagels the same as No-knead Crusty Bread. When the oven is preheating, place a large cast iron pot with lid in oven to heat. Place a few bagels on parchment paper and drop into heated pot. Cover with a lid and bake covered for 12 minutes. Remove lid and bake an extra 4-6 minutes or until golden. This method produced the best bagel that was crisp and crunchy on the outside, but tender on the inside. Amazing. This recipe makes about 14 5 to 6-inch size bagels. 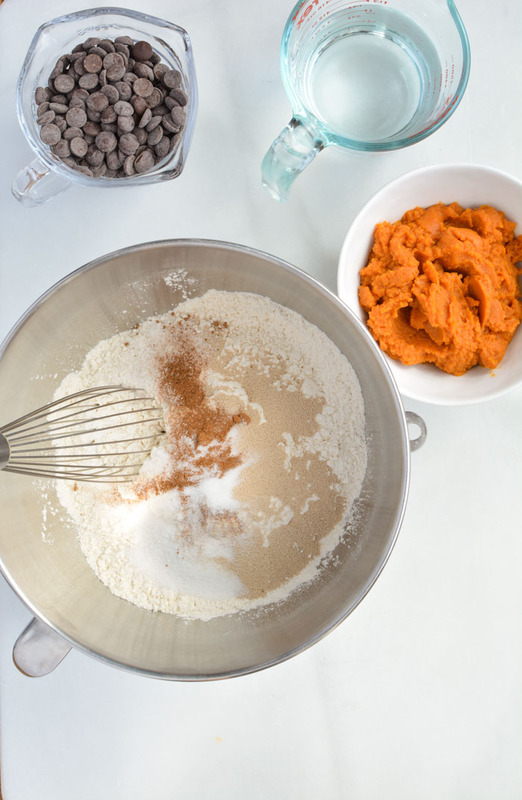 Mix flour, sugar, yeast, salt, and pumpkin spice in a large bowl. In a small bowl mix water and pumpkin together. 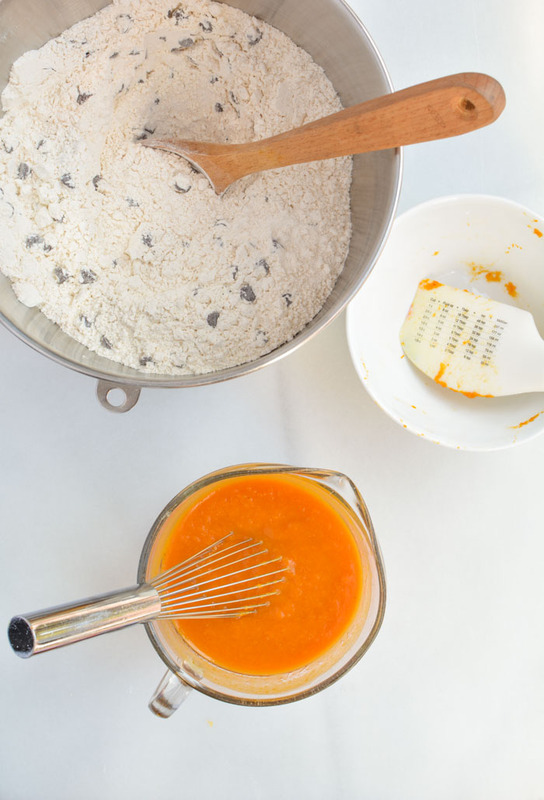 Pour over flour mixture without kneading, using a spoon, hands, or large mixer with paddle attachment. Making sure all of the flour has been incorporated. Cover dough with plastic wrap and allow to rest at room temperature for 2-3 hours. Refrigerate dough covered dough overnight or up to 4 days. 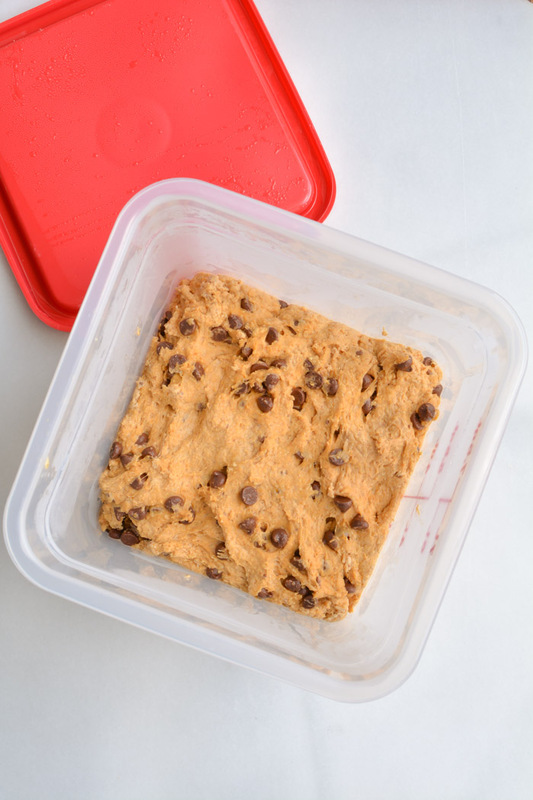 Dough can be transferred to a container with a lid, but not an airtight lid. 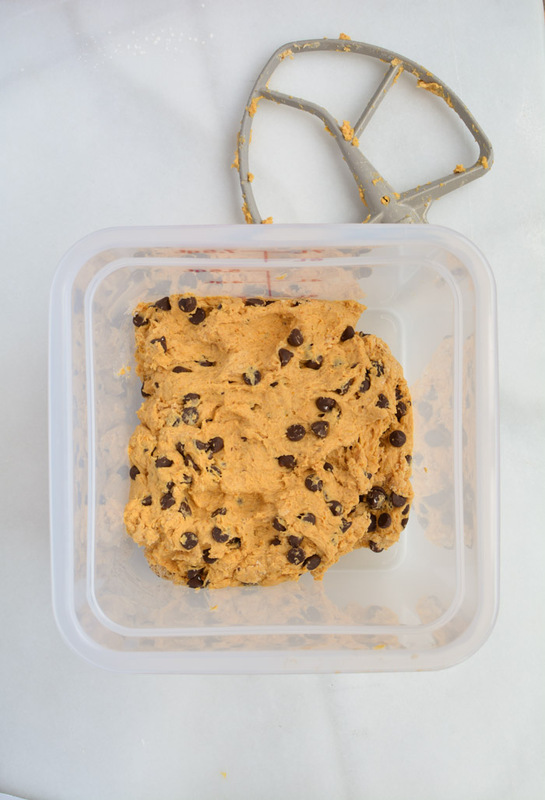 Remove dough from refrigerate for a carefully remove from container or bowl. 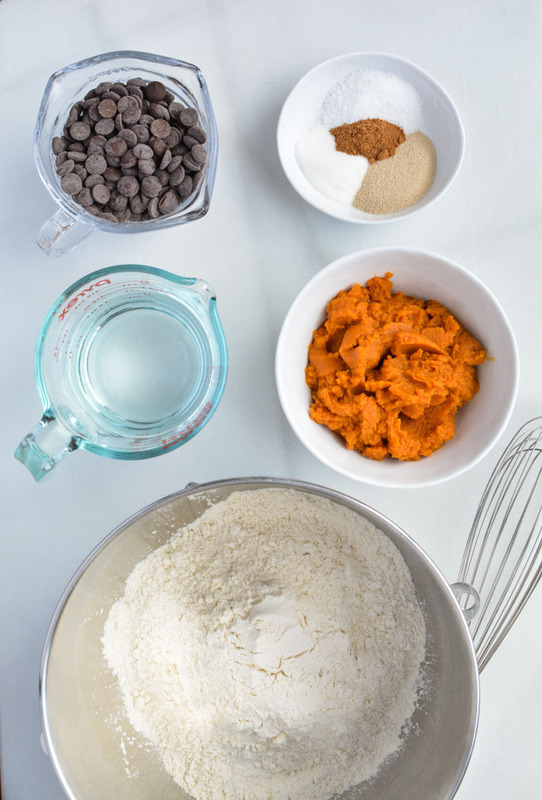 Divide dough into 14 pieces that weigh 125 grams or 4.4 ounces (give or take) . With each piece of dough press and degas the dough into a rectangle shape. Fold in dough along 2 sides, then roll dough into the shape of a log. Cover loosely with plastic wrap and let dough rest for 5-10 minutes. Take each log and roll into a 10-11 inch rope. Wrap the rope around your hand and overlap 1-2 inches. Press and crimp overlapped dough while rolling back and forth on a non-floured surface to create a bagel shape. Place each bagel on a floured board or cloth about 3-inches apart to allow for rising. Cover with plastic wrap and let rise for at least an hour. The dough should feel like a marshmallow when touched. Preheat over to 450F degrees. Add water, brown sugar, and baking soda to a large pot. Heat until barely begins to simmer. Add bagels 2-3 at a time (don't over crowd) and simmer in hot water for 5-10 seconds on each side. Remove with a slotted spoon or a spider place on a clean cloth to remove any water then directed onto a parchment lined baking sheet and bake in preheated oven for 14-16 minutes or until golden brown. For hearth baked bagels, place a pizza stone in oven and heat to 450 degrees for at least an hour before baking. Bagels can be baked in a heavy cast iron dutch oven with a lid. Place 2-3 bagels on a sheet of parchment paper and lift into pot that has been preheat in 450 degree oven for 30 minutes. Cover with lid and bake for 10 minutes. Remove lid and bake for an additional 4-6 minutes. This method makes the most amazing bagels. It just requires more time or a much larger pot. For a more savory bagel, omit chocolate chips and pumpkin spice. Chopped pecans may be added in place of chocolate chips.